Well, not exactly. I can cut through the guys apartment below me to get outside, but the tree in front of my apartment just fell over, bocking the front door! I managed to get outside, which I wouldn't recommend to anyone, to move my car. Here are a few of the pictures that I managed to get with my iPhone. If I was crazy I might go outside with my good camera and take a few high resolution ones just for fun. However, I think I'll wait until the wind dies down some before risking bodily harm. 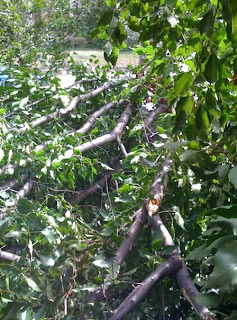 This is the tree that fell, it isn't huge but it takes up the entire front yard. This is the path up to the front door. It isn't passable. This is what it looks like from my front door. You might be able to climb your way out, but it wouldn't be fun. Right now I've managed to not lose power or internet. :D My car hasn't taken any damage besides the debris that is hitting it. 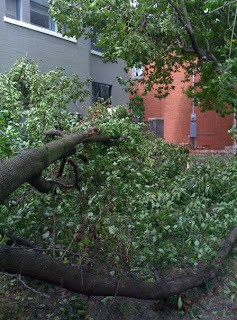 However, in the neighborhood around my apartment there are several, very large, trees that are down and power and traffic signals are down too. 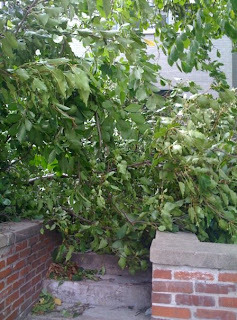 There are also a few close call with several trees that almost fell on top of some cars. I really didn't expect this today. Most technology news group quickly publish their review of anything new after it has only been out for a few days. While this is logical to drive large volumes of traffic, it doesn't always give the product a fair chance. I've been using Google Chrome as my primary browser on my laptop for a while now and it isn't that bad. How could I resist already having Firefox 3, IE 8 Beta, Opera, and Safari on my computer. First off, I will bring up the fact that Steve Gibbson wasn't a fan of Chrome as he outlined on Security Now 161. However, most of the things he brought up were not major concerns of mine. While the handling of third party cookies is a concern, Firefox and IE are about the same. Additionally, black/white listing of pages for scripting is an annoyance but I've never done that. Also, the memory footprint of Chrome is different but as Google outline it is a trade-off for security and stability. Steve also pointed out that the Omni-Bar is a real time keystroke logger. While this is a security risk, it also is a tool that I've found useful. Google is the king of simple interfaces. However, Chrome, for its simplicity, offers a wide range of features. While many will point out the fact that nothing here is innovative, it is still a solid feature set. Chrome has that creepy, it know what you want to do feeling that Google has worked so hard to master. The interface is very simple. Simple to the point where you refuse to believe they have packed all of these features into a browser. The primary way I have been using Chrome is the Gmail application that I created in Chrome. Basically, an application simulates a desktop application. It further removes the browser, basically making the web page full screen. Also, clicking a link that points out of the application will open in a new window leaving your application untouched. If I continue to use Chrome it will most likely be that I will services like Gmail in the browser. Speed is a big concern when it comes to web 2.0 application. Chrome really does feel a little zippier. This may be because I rarely drop below 8 tabs and will sometimes go as high as 15 tabs in a single window. While Firefox in the past has started to choke, often because it was using a half a gig of ram, Chrome has stayed solid. I have only had one tab crash and it didn't interfere my other tabs at all. It was a simple process to kill the bad process. IE has already moved to this model and I suspect Firefox will need to do something to react to this trend in the market. While it does sacrifice some speed and uses slightly more memory, the trade-off of security and reliability will likely win. Other than what I outlined above, Chrome is just a simple browser that works. It is good because it feel light weight. Unlike when I use IE, I don't feel like I have a lot of mass that takes forever to get moving quickly. Firefox gives this same feeling, and it might just be that Chrome is shiny and new, but it still appeals to the Geek in me. It is also important to point out the Chrome hasn't had any problems to my knowledge rendering web pages that I visit. Everything looks good enough to browser. This is likely because of the Webkit that sits under everything. There isn't that much to say in this category that isn't already obvious. The most glaring problem when moving to Chrome is that it doesn't have all of the amazing add-ons that Firefox has become famous for. However, I have found I don't miss most of them. While there are a few that I feel like I want back, they aren't deal breakers. Also, Chrome has said they will eventually bring plug-in support but warned that these plug-ins will punch holes in the sandboxes that Chrome worked so hard to create. I'm not going to focus much on the negatives, as Steve Gibbson spent over an hour on that subject. However, the future looks promising for Chrome. This is the part that I like to talk about: What was Google's goal in releasing Chrome? The only real place they took browser market share from was Firefox and a large fraction of that has already abandoned Chrome. First off, I think Google is attempting to push the market forward. Since their focus is on web applications, having a cutting edge open source browser will only push the market forward. Even if their innovations are quickly adopted by other browsers, the final goal of improving consumer experiences was accomplished. While there was an interesting point of contention between Firefox and Google now that they are competing on some level, I don't view them as direct competitors. Chrome will not gain large market share just as Gmail hasn't gained large market share. Its penetration will only be wide spread in geek circles if at all. However, Firefox has begun to cross over into mainstream and that battle was hard fought. So, what is the point of Chrome? I don't think it is mean to compete with the browser market. That lofty goal is too low for Google. Honestly, I think Chrome is designed to go after the operating system market. While this may seem like a stretch, it bring Google's plan to its logical conclusion. A very fast web browser could function as the core component in a web based operating system. With the additional highly integrated support of Google Gears and the increasing number of Google web applications that support Gears, it becomes that Chrome isn't like other web browsers. While Gears is available in other browsers, as it should be, it doesn't benefit from very tight integration. It is possible, that in the future that you could install web pages as applications that bridge the gap between being online and being offline. The obvious flaw in my theory is that there is a huge jump between making a browser and making an operating system. However, looking at how Google constructed Chrome lends some hints. Chrome wasn't built from the ground up, it cherry picked code from other project and copied the best features from other browsers. There would be nothing preventing Google from shopping around various open source projects such as Linux finding the code that they need. At the same time, they could fill in the gaps with their own code. While it is just a theory, I'd keep a close eye on the direction of Chrome to notice if it starts to become more robust. Chrome is already centered around multiple processes and has a built in process manager. Add a kernel, memory management, and a file system and your off an running. I have so much work to do and Spore has been calling my name. Over the weekend I had a ton of time to play it and made it to the Space phase, but not very far into it. I've been having fun playing but it ends up the Cassie has a little more time than me to play. However, she is just to the civilization phase. You can check out my Spore Profile and my Spore Achievements if you are interested. The game is awesome but I've been having some trouble with it crashing. Specifically, crashing when I save my game. Obviously this has made me fairly upset when I've lost a fair amount of progress. As a result I've been saving fairly often. I just wish the game had an auto save feature that could be enabled. I understand why it doesn't come with it turned on, but I would definitely enable that just so I wouldn't lose progress. I'd rather it keep progress that I didn't want than lose progress that I spent hours making. Just my thought. My first main species is called Bar and is from the planet Foo. I wasn't that creative. I used buildings and vehicles from Sporepedia for the civilization phase. It was really nice to have a wide variety of choices that looked very nice for me to choose form. The next thing I want to do is use some of the Sporecasts people have made to make my on themed plant. I'm also looking forward to becoming more powerful as a space faring species. A few days back I blogged about my experiences helping out new students with their Tablet PCs. (Starting the Semester off Sprinting + STUG) To my surprise I received an email from Brian Jones who manages the customer service department at DyKnow. Since the semester started back up, I'm back producing episodes of Tablet Tips. The first episode of the Fall semester was centered around the same topic. Click ‘Send’ and wait for the information to transfer to us here at DyKnow before closing the dialog. Someone from our technical support staff and/or your local DyKnow administrator will respond accordingly. “Quote: …the biggest problem with DyKnow was that student’s accounts were not activating properly.” From what I understand [and as alluded to] this is not at all related to the DyKnow server, but rather specific to an issue with the university’s user account authentication system (Active Directory as the IT dept would call it). I believe that issue should be resolved at this point, but if the student’s continue to have account authentication issues they are advised to touch base with U of L’s IT dept. “Quote: …they are unable to send files from programs (such as DyKnow) into OneNote so they can be inked on.” This was interesting to us because we ironically got a support email from a student at U of L yesterday that was trying to print to OneNote from DyKnow via the 64-bit Vista OS. We shared the following MSDN thread with him http://blogs.msdn.com/david_rasmussen/archive/2008/04/21/onenote-64-bit-print-driver.aspx and also informed him that it is possible to ink on top of the DyKnow notes natively in DyKnow or use the resizable/un-dock-able Private Notes feature to add panel specific annotations in the DyKnow notebooks. Alternatively, students can condense their notes (e.g. two or four DyKnow panels per slide) by printing the content back into DyKnow using our Notebook Writer such to annotate the combined panels in that manner: www.dyknow.com/download. I'd like to thank Brian for reaching out to me providing useful information that he has allowed me to republish on my blog. While the beginning of the year is eventful fixing all of the technical problems of the new students, I believe that it is a necessary problem when beginning the education of Tablet using students and future engineers.